So much more than “downward dog”! Join the Y for Kitten Yoga and reap the benefits of a Yoga class with these adorable kittens. 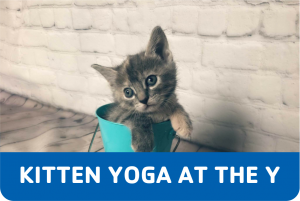 The Y will have 20 kittens to wander cutely as class participants are stretched and folded. All kittens will also be available for adoption! Registration: Register online early, only 20 spaces available per session! 100% of the money raised with this event will go to the Peoria YMCA’s scholarship & community outreach programs! The kittens are provided by TLC Fosters, a foster based animal rescue. Foster based adoptions are so important because it gives everyone a chance to evaluate that animal’s behavior in an actual household rather than just sitting in a cage. This way, the right animal gets the right home.